Your growing skills deserve a transmitter that can keep pace. 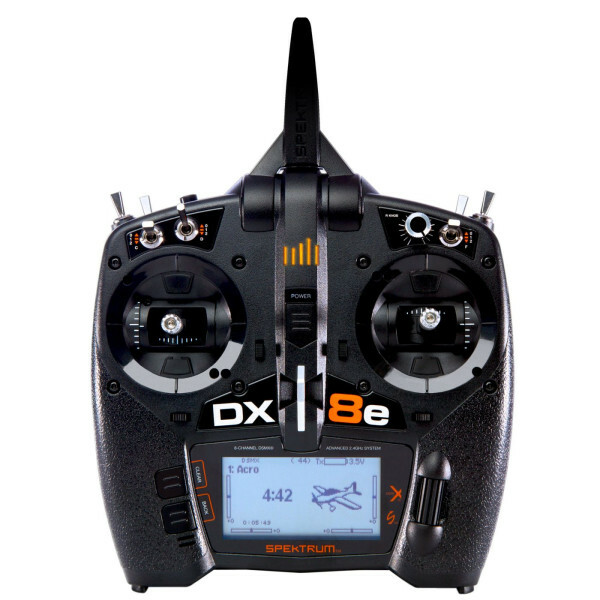 The DX8e comes equipped with the programming you need, no matter what you fly. And because it’s based on the same Spektrum AirWare firmware used in most other Spektrum transmitters, you can share model setups with just about any Spektrum user you meet. The enormous capacity of the DX8e’s onboard memory means you will rarely if ever, need to juggle models between transmitter memory and your SD card. The model memory menu is easy to navigate too. Only memory slots with model settings saved to them will appear. You won't have to scroll through empty slots or move models around if one is deleted. Key FeaturesCompact low-cost, full-range DSMX receiver with telemetryAntenna-less design increases c..
Key FeaturesCompatible with all Spektrum DSMX transmittersCompact design fits most parkflyer size an..
DSMX Remote ReceiverKey FeaturesIncludes 24-inch Remote Receiver ExtensionReplacement remote receive.. Product descriptionKey FeaturesProgrammable from most mobile devices (iOS user check for updates) as..
Key FeaturesSensor port allows the receiver to be upgraded with future Spektrum add-onsCompatible wi..